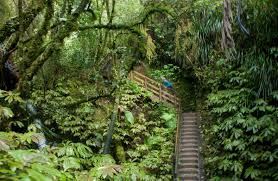 This walkway goes along the undulating forested crest of the Hakarimata Range and at the highpoint of 374 metres there is a great view out over the Waikato with Hamilton in the background, and also a summit tower for an even better view. Expect to be walking for 6 hours if you join the distance party, which will go up the summit track and then walk the Northern section of the walkway. Option to do a crossover if we have two drivers. Another party will go up the 1349 steps (a gift that keeps on giving) to the lookout and back down.